Improvements in the US jobs markets helped firm up the dollar today. The JOLTS report, released monthly by the Department of Labor, showed a record high number of job opening in July. Job openings reached 5.8 million beating May’s record high of 5.4 million. Economists put the unusually high number of openings down to skills shortages within the labor market. A tightening labor market is usually supportive of the dollar as it indicates that wages are likely to rise – adding upward pressure to inflation. The report also showed that the “quit rate” remained relatively high at 1.9 percent in July. The “quit rate” is watched closely by the Federal Reserve as a proxy for labor mobility. A high quit rate is seen as evidence of a healthy jobs market as it suggests people have confidence to move between jobs. Adding to the upbeat tone layoffs and sackings also declined during the period. Traders cheered the jobs numbers as they provide solid evidence that the US labor market remains in good shape. It remains to be seen whether the Federal Reserve will raise rates during next week’s meeting. Most analysts predict that they will heed caution and delay at least a month or two following the recent turmoil in emerging markets. The day also saw some big moves in equity and bond markets. The Japanese NIKKEI-225 rallied by nearly eight percent today after the government said that it would lower the rates of corporation tax. In China the Shanghai Composite added to yesterday’s gains after officials announced a massive stimulus program in the form of infrastructure spending and tax reforms. 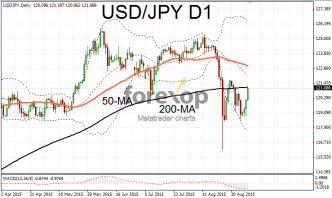 These events helped the dollar extended its rally against the Japanese yen. The greenback also firmed up against the euro and British pound. 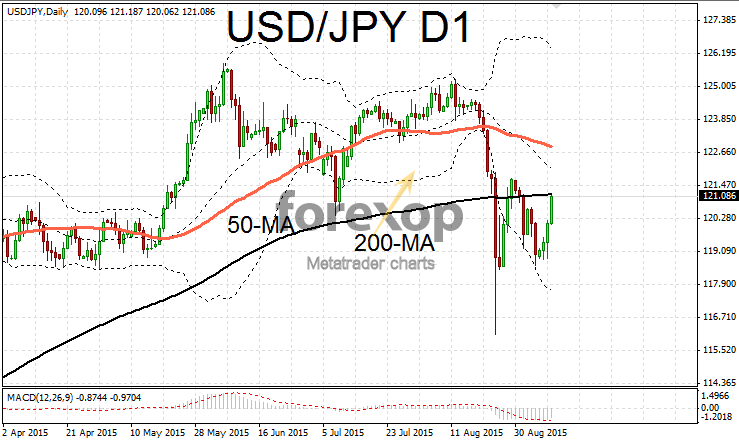 USD/JPY rose to 121.71 extending a four day rally that’s pushed the pair up nearly two percent. Strong resistance around the 200-day moving average capped gains, but the momentum was favoring the greenback. The dollar was also trending higher versus the euro on Wednesday. Sentiment in the euro remains fragile however after ECB President Mario Draghi warned that a further round of quantitative easing may be necessary to “jump start” the flagging Eurozone economy. This is being felt as the euro failed to capitalize of recent dollar weakness. EUR/USD found support around 1.1137 but bulls and bears were fairly evenly balance throughout the day which kept the pair trading within a tight range. Most traders were adopting a “wait and see” approach ahead of the Fed’s critical September policy meeting which is scheduled for next Wednesday and Thursday (16-17 September). The statement will be released following the two day meeting.